This episode is part of a regular series on the Board Shorts podcast called Boardroom Insider of the Month. 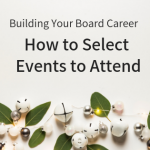 In these episodes I interview experienced board members to bring you the inside information on how they started their board career, what their opinion is on essential board member skills, the future of the boardroom, their biggest boardroom challenge, and the advice that they have for new and aspiring board members. In this episode, I talk with Andrea Slattery, a stalwart in governance for over 25 years. For 11 of those years, Andrea has been involved in highly scrutinised, highly regulated and high-profile Government, ASX, commercial and NFP Boards, as well as on Federal Government and Regulatory Advisory Committees. Andrea started her board career on small NFP, community, and sporting boards and committees as a volunteer. Over many years, she has built her board portfolio (and continues to build her portfolio) and currently sits on the Boards of Clean Energy Finance Corporation, Argo Global Listed Infrastructure, Centrepoint Alliance Ltd and South Australian Cricket Association. Andrea, now as a full-time Non-Executive Director & keynote speaker, embodies authentic, values-based leadership. She is a recognised expert in focusing on how businesses can most effectively engage with their customers and clients via multi-channel and new age service and technology models. She was actually the founder and managing director of the Self Managed Super Fund Association of Australia. In this episode we talk about the differences in community vs. board expectations, how to balance competing interests on a board, why being a good executive/manager doesn’t mean you’ll make a good board member, the future of the boardroom, and how to get from an executive career to a board career. 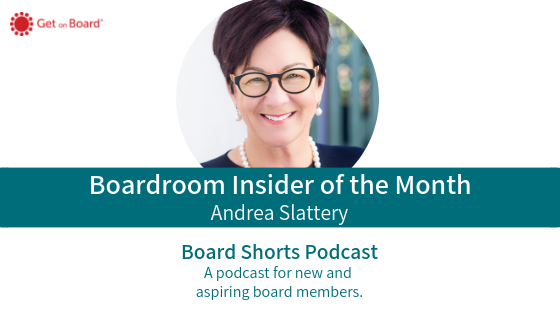 Andrea Slattery has been an Independent Non-Executive Director and Governance expert for 26 years; 11 of those in highly scrutinised, highly regulated and high-profile Government, ASX, commercial and NFP Boards as well as on Federal Government and Regulatory Advisory Committees. She currently sits on the Boards of Clean Energy Finance Corporation, Argo Global Listed Infrastructure, Centrepoint Alliance Ltd, and South Australian Cricket Association. She has proven experience in financial services, infrastructure, government relations, investment, innovation and is an expert in strategy, governance, entrepreneurship and transformational change. Starting her career in Tax and Academia, Andrea was the Founder, Managing Director and CEO of the SMSF Association for 14 years and currently retains a Director role. She led the seven-fold transformational growth of the SMSF Sector in Australia from 20% (or $109B FUM of $535B in 2003) to the largest sector of superannuation in Australia with 30% (or $750B FUM of $2.5T in 2017). Andrea has been publicly recognised by two Prime Ministers, Government, Media and the International Finance Community as one of the most influential and strategic thought leaders in Financial Services and retirement systems and recognised as also as helping to generate wealth for millions of Australians enjoying a higher standard of living in retirement than they would have otherwise experienced. Andrea, is now a full-time Non-Executive Director and keynote speaker, embodying authentic, values-based leadership. A considered and thought provoking strategic thinker, an agile innovator who thrives in the face of disruption and challenge, she offers compelling insights into corporate culture and strategies and cross industry transformation within a highly regulated environment. She is a recognised expert in focusing on how businesses can most effectively engage with their customers and clients via multi-channel and new age service and technology models. In all her roles, she has displayed a strategic capacity to effect major, long-term change – a disruptor of industry norms. She has a critical understanding of business risk, security capabilities and knowledge of financial markets and has been instrumental in effecting significant change for the equality of women and consumer engagement. Andrea was awarded ‘Australian Woman of the Year in Financial Services’ 2014, nominated for ‘Australian of the Year’ in 2017, a finalist in the ‘Telstra Business Women’s Awards’ (SA) 2016 and was awarded ‘AFL Mother of the Year’ in 2009. Andrea has also presented on retirement, culture, women, and transformational change in China, Europe (to the United Nations), USA, UK and Vietnam. 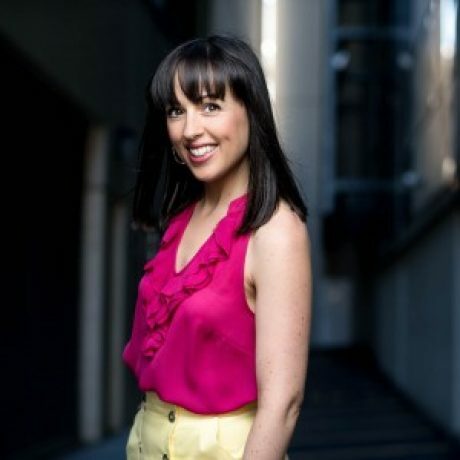 Andrea holds a Masters of Commerce & Bachelor of Arts in Accounting from University of South Australia. She is a Fellow of the AICD, an SMSF Specialist Advisor, a CPA, an alumni of the Harvard Business School, and a member of CEW. Andrea, and husband Paul, live in Adelaide and have four sons, four daughters-in-law and 11 grandchildren. She loves family, friends, wine & playing tennis. 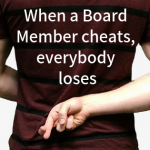 0 responses on "Boardroom Insider of the Month: Andrea Slattery"